Please click on the link below which gives details of our admission arrangements for the school. 2. 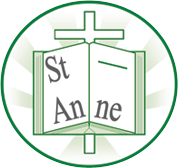 Baptised Church of England children whose parent(s) are on the electoral roll of the parish of St. Anne (Stanley). 3. Baptised Church of England children from other parishes. Proof of baptism will be required. 4.. Children who have a brother or sister in the school at the time of admission. 5. Children from other Christian denominations. Proof of baptism or a letter from a religious leader confirming membership of the denomination will be required. 6. Children of other faiths. Applicants will be required to provide a baptismal certificate or a letter from a religious leader to confirm membership of the faith. 7. Children whose parents express a preference for a place at the school. If there are more applicants for places than there are places available in any of the above criteria distance from home to school will be used to decide which children are admitted. The distance will be measured by the shortest suitable walking route between the child’s permanent home address and the main entrance to the school. The children living closest to the school will be allocated the available places. If the school is oversubscribed the governors will require parents to provide proof of address e.g. council tax bill, utilities bill, exchange of contract or a tenancy agreement. The governors will admit any pupil whose final statement of special educational needs or Education, Health and Care Plan names the school. Where possible such children will be admitted within the published admission number. Many parents don’t realise that they have to re-apply for Reception after getting their nursery place and don’t fill in the paper work in time. As it is all done through the LEA school cannot track who has and hasn’t applied and some families have lost out on places in the past due to late applications.